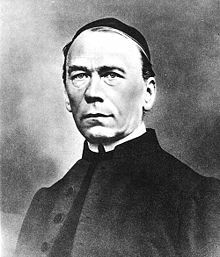 Blessed Adolph Kolping (8 December 1813 — 4 December 1865) was a German Roman Catholic priest and the founder of the Kolping Association. He led the charge for providing and promoting social support for workers in industrialized cities while also working to promote the dignities of workers in accordance with the social magisterium of the faith. The beatification for the late priest commenced on 21 March 1934 and he was later titled as Venerable in 1989. His beatification was celebrated under Pope John Paul II on 27 October 1991 in Saint Peter's Square; his liturgical feast is not affixed to the date of his death as is the norm but rather on 6 December. Adolph Kolping was born on 8 December 1813 in Kerpen as the fourth of five children to the poor shepherd Peter Kolping (d. 12 April 1845) and Anna Maria Zurheyden (d. 4 April 1833). He often lived in the shadow of frail health during his childhood. He proved to be an able student while in school from 1820 to 1826 but his poorness prevented him from furthering his education despite his commitment to pursue additional studies. In 1831 he travelled to Cologne as a shoemaker's assistant and soon became shocked with the living conditions of the working class that lived there and this proved to be definitive in influencing his decision to become a priest; he remained a shoemaker until 1841. In summer 1834 he attended the Three Kings School and afterwards in 1841 began his theological education in Munich (1841–42) at the college there as well as later in Bonn (1842–44) and Cologne (26 March 1844 – 1845). His time spent on his studies saw him become friends with the future Bishop of Mainz Wilhelm Emmanuel von Ketteler. Kolping was ordained to the priesthood on 13 April 1845 in Cologne's "Minoritenkirche" but his father died the night before so his ordination was full of mixed emotions. He first served in Elberfeld – now part of Wuppertal – as a chaplain and religious education teacher from 1845 until 1849. In 1847 he became the second president of the Gesellenverein which gave its members both religious and social support. In 1849 he returned to Cologne as the cathedral's vicar and established Cologne's branch of the Gesellenverein. He united the existing associations as the "Rheinischer Gesellenbund" in 1850 – this fusion was the origin of the present international "Kolpingwerk". In 1854 he founded the newspaper "Rheinische Volksblätter" (or the "Rhine Region People’s Paper") which became one of the most successful press organs of his time at a rapid pace and the first issue was published that 1 April. He was the editor of the Catholic People's Calendar from 1852 to 1853 and of the Calendar for the Catholic People from 1854 to 1855. In 1862 he became the rector of the Saint Maria Empfängnis church. Pope Pius IX titled him as a Monsignor in 1862 – this came about after the pair met in Rome in a private audience in May to discuss the priest's work. He died on 4 December 1865 due to lung cancer; his remains are buried in the "Minoritenkirche" in Cologne. Kolping had suffered from a severe joint inflammation in his right forearm that spring. He is remembered as the "Father of All Apprentices" and in 2003 was ranked eleventh in the Unsere Besten. Pope John Paul II visited his tomb in November 1980 while visiting the nation. The beatification process opened under Pope Pius XI on 21 March 1934 and the late priest became titled as a Servant of God as a result of this introduction; the informative process opened on 21 March 1934 and later closed after an unspecified duration but later had to receive validation from the competent authorities in Rome for the cause to proceed. The historians approved the cause on 24 February 1987 while the Congregation for the Causes of Saints received the Positio from the postulation in 1988. Theologians approved the cause on 15 January 1988 as did the C.C.S. on 18 April 1989; the confirmation of his heroic virtue allowed for Pope John Paul II to name him as Venerable on 13 May 1989. The miracle that led to his beatification was investigated in the diocese of origin and later received C.C.S. validation on 5 December 1987 before a medical board approved it on 24 January 1990. The theologians also approved the cause on 18 May 1990 as did the C.C.S. on 23 October 1990 while John Paul II issued his definitive approval for it on 22 January 1991. The pope beatified Kolping on 27 October 1991 in Saint Peter's Square. ^ a b c d "Blessed Adolph Kolping". Saints SQPN. 1 December 2016. Retrieved 8 December 2016. ^ a b c "About the Founder". Kolping. Retrieved 8 December 2016. ^ a b c d "Blessed Adolfo Kolping". Santi e Beati. Retrieved 8 December 2016.